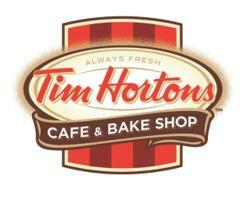 Tim Hortons proudly sponsors the Clarence Soccer Club Division 5 and Little Critters programs. Youth Soccer development is a key community initiative for Tim Hortons through its commitment to youth sports and also because restaurant owners live and work in our community. They find sponsoring youth athletics a great way to get to know area families and customers. The Timbit program philosophy is not based on winning or losing – but on learning a new sport, making new friends, and just taking time out to be a kid! Tim Hortons Cafe & Bake Shop will reward your Timbits players with a new delectable treat! Come in to your local Tim Hortons store after your Timbits soccer game for 4 Timbits at no charge – just for being a Timbits soccer player and wearing your uniform! Player must be wearing his or her Timbits soccer jersey. Applicable for in-store visits only (no drive thru). Offer applicable from season start date through season end date. One package of 4 timbits per player, per game day.